I started thinking of that Paul Simon song but then actually started reading the book. I like young adult books. I especially like any story that has to do with leaving the mundane planet Earth and melding into a new fantastical world of aliens, dragons, various two headed monsters and demons. All those things sound scary but remember this is a young adult book and the story is told in bright happy colors! Our 12 year old hero Erik is the only living boy in this crazy new world. Every minute he must be on his guard to face whatever the world throws at him. It pretty much just keeps throwing things at him but he does make a few friends in his struggle to survive. This 50 pages first issue does leave me wondering about the female characters introduced to the story. I don't always like these sort of male-centric adventure stories for children and young adults. The reason being, that the female characters are often devoid of actual character, need saving OR need to be vanquished because they are evil. Here we have two female humanoids who's alignment, not to mention their age is unknown. Erik is 12. I'm fairly certain the female characters in the story are not his peers as they look well post-pubescent. For those of you who don't know, you have to be a comic professional to vote for Harvey Awards lol so that also means I cannot vote. I haven't published anything besides interviews and reviews. BUT ONE DAY!! I really love the cover of issue 1. It is a little deceivingly dark but I really like it. 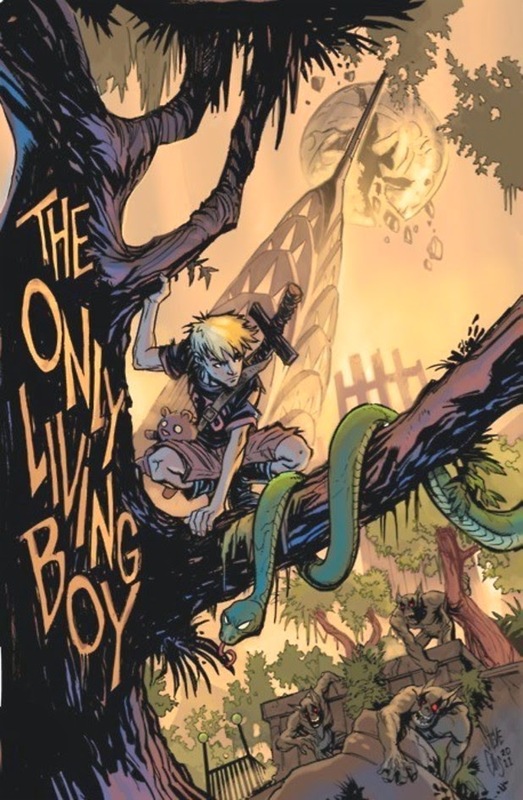 The Only Living Boy started out as a webcomic but through a successful Kickstarter fund in 2012 you can now get issue 1 and 2 through ComiXology. Despite my initial concerns regarding the direction the writing might take the female characters, the story is cute, fast paced and engaging. Plus... two headed dragon. That's a big point booster right there. It's clear that both Gallaher and Ellis are winning combination.